At night, it's all about vibration! The BOOYAH Moon Talker was designed with the avid night fisherman in mind. 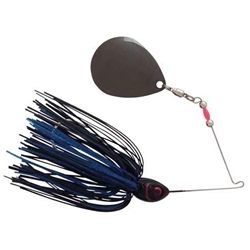 From the 50 strand Bio-Flex silicone skirt to the hard thump'n black nickel Colorado blade, this bait creates vibration and delivers bites. So if you like to catch big fish at night, stop messing around with hit & miss, "flash in pan" baits. Tie on a lure that's designed to catch fish not fisherman!